Puchong, 26/5: Tun Dr Mahathir Mohamad is in Japan for a follow-up on an eye surgery he had recently. Najib Razak is also in Japan on a three-day official visit. One advisor to the Prime Minister, when asked, said he did not know if the two would meet in the Land of the Rising Sun. Why did I ask? I was yesterday reminded that this very month in 2006, both the Tun and Abdullah Badawi, the PM then, were also in Tokyo. They were not having the best of relationships, too, and they had met briefly. The meeting went well but not the events that followed. The Pak Lah-Mahathir meeting led to a sharp decline in ties between the two men (and lawsuits involving their men). There would be all-out war afterwards that resulted, in 2008, the worst ever GE-on-GE results for the ruling BN coalition. I doubt that Dr M and Najib would be meeting in Tokyo:, the Tun is in pain and the PM would be too busy with Shinkansen and the second phase of the Look East Policy. Will the new Kalimullah spin for PM? Who will he be???? Dear Rocky , the most the doctor will just have a quick look of his eyes with funduscope. Painless. Anyway , this what the Grand Ole Man of Malaysia , advising Abe in a Tokyo conference, with Abe in attendance. Former Malaysian Prime Minister Mahathir Mohamad called on Japan to refrain from needlessly offending neighboring countries and to pursue dialogue to resolve issues over territory and history. In a speech in Tokyo on May 21, Mahathir, 89, emphasized that bilateral disputes should be sorted out through negotiations and legal means--not by military force. 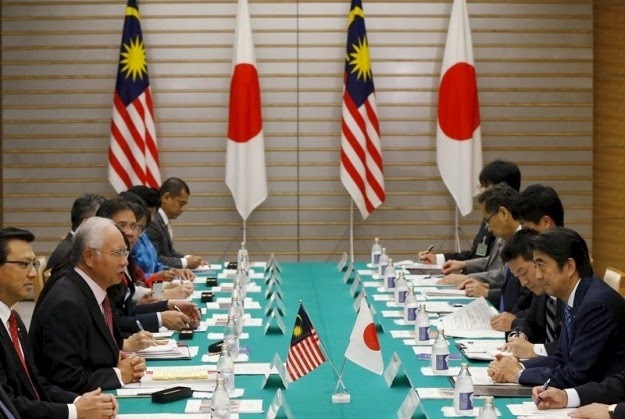 Mahathir also directed his comments at Japanese Prime Minister Shinzo Abe. Mahathir noted that Malaysia and Thailand reached a compromise over a territorial dispute by deciding to share offshore resources. He said Japan should not resort to force in settling its disputes over islands also claimed by China, Russia and South Korea, saying Tokyo would gain nothing by again becoming a country that makes war to solve its conflicts. I suspect that Tun is well and truly done with talking to Najib, either in Tokyo or elsewhere. Blame Najib for that. He is not winning any new fans right now, and the public is on Tun's side. No amount of cash thrown at Lim Kok Wing is going to help, at this stage. "Helen Ang has expressed diametrically opposite views." "Surely, she can't be as cold-blooded and devoid of the slightest shreds of empathy and humanity, can she? I am waiting for her to go after Anifah Aman in her blog." Ahhhhhh, Ridhuan Tee and Helen "AkuGreek" Ang. Two middle-aged Chinese men who just try too hard, oh so, so desperately hard. Pathetic, really. Personally, I'm with Anifah on this one. If we donate to the Palestinians, we can certainly reach out to fellow Muslims closer to home - surely. Helen AkuGreek can stick that right up her hypocritical, wannabe pigsterior. I am a little bit surprise that the half breed is not getting his eyes problem being looked into in Malaysia. He must have forgotten that Malaysia is trying to get Malaysia recognized as a medical centre for medical tourist. Yet he himself is getting his own medical needs in Japan. Why is he not getting his eyes checked in Malaysia instead when Malaysia is trying to convince the foreigners to come to Malaysia for their medical needs ? Surely this is a sign that all is not seem to be that well in Malaysia as what the authority is trying to project ? To begin with is the attention of his regular visits to London impeding him to go to London or that part of the world for now ? Also why is he not getting his medical needs in Singapore when thousand of foreigners are flocking there, including some sultans and also a lot of the VIPs from Malaysia going to Singapore searching for cure to their medical problems ? It is best that both of them did not meet . PM Nagib was the protege of Tun M those years . He knew every Tun M move . PM Nagib have said it that he will continue to be PM even if he win with one vote . Have we heard this before ?. The only way out is to let Tun M say whatever he want to say and let PM Nagib do whatever he want to do . In the end the people will have to make a decision . That will be in 3 yrs time . Meanwhile , let's enjoy whatever that we have.